As a young officer in the Army, Miguel Gastellum observed that the most respected commanders were always those who led by example. “They were the kinds of leaders who were out in the elements with the troops when no one else wanted to be out there,” he says. Leaders like these—who voluntarily exemplified the standard they expected and weren’t afraid to get uncomfortable with their soldiers to accomplish a mission—quickly won the trust of the people they commanded. Gastellum learned that, in the military, the rank on a collar doesn’t earn respect; respect is earned by showing integrity in the example by which you lead. This leadership philosophy has informed Gastellum’s ascent at FTS International, one of the largest oil and gas well-extraction companies in North America. 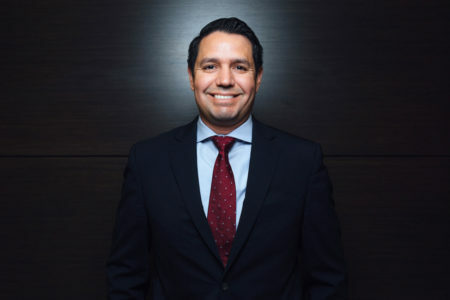 He oversees the supply chain that provides all the materials for well sites in Texas, coordinating the supply of the maintenance parts that go into pumping. Gastellum is responsible for one billion dollars in spending. Additionally, he’s remained even-keeled throughout the ups and downs of the oil and gas industry. Right now, the industry is in a “soft spot,” he says, but the stress of weathering an industry downturn is relatively mild compared with the demanding pressure he’s experienced as a West Point cadet and military officer. Born and raised in Arizona, Gastellum was an ambitious student with parents who had always prioritized his education. His father was a teacher and his mother was a school administrative assistant. “I didn’t have the option to not go to college,” he says. His decision to join the military, on the other hand, came as something of a surprise to himself and his family. During high school, Gastellum had the opportunity to meet West Point cadets who gave a presentation about the school. He was impressed by the way they carried themselves. The encounter also renewed Gastellum’s interest in aviation. He was eventually nominated to attend West Point by Senator John McCain and Congressman Jim Kolbe. One of the purposes of a military education is to prepare cadets for the intense pressure they’ll experience in combat. All cadets go through six weeks of basic training before their first semester. Gastellum found basic training to be physically and mentally grueling, but the schoolwork was even more challenging than basic training. A 4.0 GPA student in high school, Gastellum now struggled to stay awake during classes and to keep up with the regimented schedule. “They intentionally give cadets a heavy workload and not enough time to do it,” he says. Eventually, Gastellum found his footing. His first year at West Point taught him how to prioritize tasks: he started the hardest work first. He also found a stress outlet playing for the school’s baseball team. “It allowed me to have a place I could go to wind down. There was a team mentality, and it took away some of the stresses the institution puts on you,” Gastellum says. However, the stress of being a cadet would only intensify after he graduated. Gastellum had entered West Point during peacetime; he had not expected to graduate into a wartime military. On September 11, 2001, Gastellum was starting his senior year. He and his classmates watched news coverage of the Twin Towers falling just forty-five miles away from their campus. They knew their country, and the lives of American soldiers, were going to change forever. “Everyone felt some sense of fear of our new uncertain future and angry at the same time,” he remembers. After graduation, Gastellum attended flight school and was later deployed to Iraq with the 4th Infantry Division of Fort Hood, Texas. He served two tours of duty, then volunteered to assess and was selected for the military’s elite special operations aviation task force, the 160th Special Operations Aviation Regiment (Airborne), otherwise referred to as the Night Stalkers. 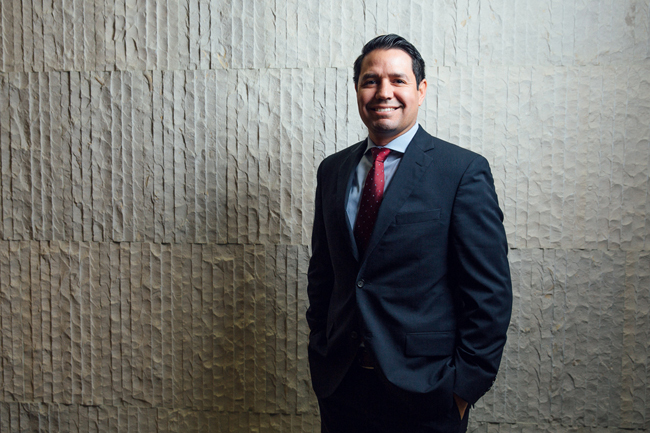 Although Wharton students come from diverse backgrounds, Gastellum was one of only three Mexican-Americans in his class. “Other Mexican students were not Americans, and most international students came from wealthier backgrounds than we [Mexican-Americans] did. We would talk about why there were so few of us,” he says. He suspects that perhaps it’s because Mexican-American families are so close, it can be hard for parents to let go of their children, so they don’t advocate leaving home for education. “We can go ahead and let our kids leave, and I’ll guarantee they’ll come back,” he laughs. “They’ve got to get some of that good food!” He also notes that some Mexican-American families do not realize higher education is a real option, even if you come from lesser means. Gastellum says that he’s been the one of the few Mexican-Americans in nearly everything he’s done. That experience has established his belief that it’s important for Hispanic leaders to help shape the next generation. “We need to get in front of our youth and show them that people have out gone and done it,” Gastellum says. He also observes there’s a serious lack of Hispanic representation in school curriculum. This exclusion can leave Mexican-American students feeling like outsiders and unaware of prominent Mexican-Americans in our history. “We need to rewrite the history books to highlight these examples,” he says. Gastellum wants businesses to know and want to place Hispanic leaders in charge and let them succeed—then, there will be a ripple effect, driving improved outcomes for the US economy. With that in mind, Gastellum has recently become involved in projects that develop the talent of Hispanic children and youth, such as Leadership ISD, whose purpose is to create activists that promote public education in Texas. He’s also interested in seeking out other Hispanic leaders who can tell their stories to young people. “How do they end up being successful in the community?” he asks.